Herpes zoster, or shingles, is a viral infection of the chicken pox family. Younger individuals can get the virus as well, although it isn't as common. Shingles creates a highly sensitized, itchy skin surface that affects the back to the ribcage and onto the chest. Some individuals can also get shingles on the face, neck and throat. Shingles usually creates a raised, blistered rash after the initial skin sensitivity and itching stage. Since shingles affects the nerves, itching and pain at the skin level are common. Shingles can be intensely painful--the itch can actually feel as painful as an injury. Shingles is a viral condition caused by the varicella or chicken pox virus. Common symptoms include an itchy rash, blistering and painful or sensitive skin. Fever and flu-like symptoms may also be present. Shingles itching and pain usually clears up within a few weeks. In rare circumstances, symptoms may last for months or recur. Use cold cloth compresses to ease itching and sensitive skin. Natural fiber compresses such as cotton should be considered to reduce irritation. Luke-warm baths will help provide relief from itching and pain. Consider adding a cup of colloidal oatmeal to the bath water to soothe the skin. Colloidal oatmeal simply means finely ground oats and they can be purchased at most drug stores, or made at home by grinding whole oats in a food processor. Try over-the-counter creams and oral medication to reduce itching and pain. Calamine lotion may be used on rashes to prevent itching and help heal blisters. Antihistamines, commonly used for allergies, often provide short-term relief for itching. Aloe vera gel may also be used to soothe and heal the skin. Opt for pure/natural aloe vera as some commercially sold gels contain alcohol that can further irritate the skin. Speak with a doctor about prescription strength medication for severe symptoms. If a shingles outbreak is caught early (within a few days of symptom onset), an antiviral serum may be administered to speed healing and prevent excessive itching and pain. Corticosteroids may also be prescribed to relieve swelling, itching and pain. Corticosteroids may be given orally or by injection, but long-term use is not recommended as side-effects such as mood swings, high blood pressure, eye problems and calcium loss may occur. Avoid stressful situations as this may worsen itching, pain and rashes associated with shingles. Practicing alternative relaxation techniques such as meditation, yoga and tai-chi may help lessen shingles symptoms in some people. According to the National Center for Complimentary and Alternative Medicine, tai-chi may even help prevent shingles outbreaks in older individuals. Prevent secondary bacterial infections by avoiding scratching at blisters and rashes. It may be beneficial to cover the hands with cotton gloves at night to prevent scratching during sleep. This technique is particularly helpful with small children. Shingles treatments should be done under the supervision of a doctor to avoid severe shingles complications such as eye problems or neurological damage that may affect hearing, balance and muscle control. 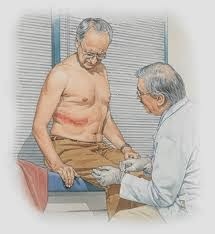 Visit a physician to properly diagnose the shingles and begin an antiviral medication such as acyclovir or famcyclovir. These medications help decrease the duration and severity of the shingles infection, according to the National Institute of Neurological Disorders and Stroke. Shortening the attack will also decrease the itching associated with the rash. Individuals need to take the medication as directed by the physician or pharmacist. Ask the physician for a prescription for a corticosteroid pill or cream to treat the rash. Over-the-counter steroid creams may also help. The steroids will help decrease itching, pain and swelling from the shingles rash. Apply over-the-counter anti-itch creams and ointments to help decrease the discomfort. Medications used for easing skin rashes such as poison ivy, including calamine and diphenhydramine, can help stop the itching from shingles. Take an oral antihistamine medication such as diphenhydramine to help combat the itching. Place cool, wet compresses such as washcloth on the rash to relive pain and itching. Mixing white vinegar and water together may provide more comfort. Reduce stress and tension while you are sick. Stress aggravates the shingles condition by weakening the immune system. Give yourself time to recover from this debilitating illness. Soak in a bath containing colloidal oatmeal to help relieve the itching, according to the University of Maryland Medical Center. Avoid hot baths because they can dry out the skin and increase the itching. Take any prescribed medications such as steroids and antiviral drugs as prescribed to help reduce itching and combat the original shingles illness.